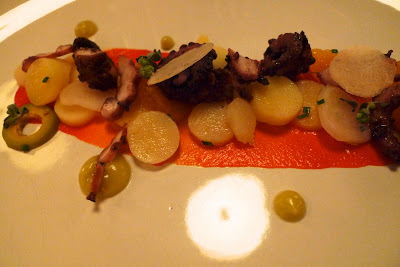 We celebrated our friend Gook's birthday at Graham Elliot months ago. 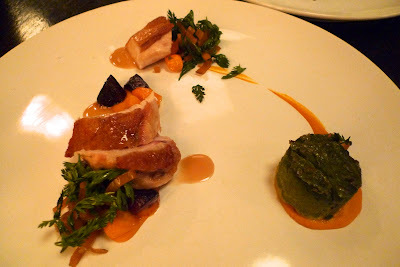 We happened to go when they were revealing their spring menu, so that just goes to show how long ago this was. Sorry guys! I've always wanted to try Graham Elliott, but I had heard some mixed reviews. 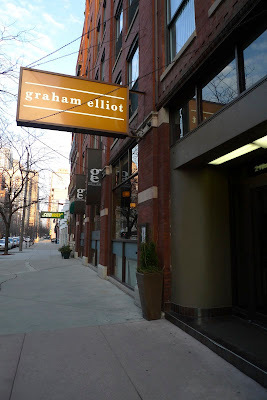 I have to say that I was pleasantly surprised and ended up leaving the place a bigger fan of Graham Elliot than before (if that's even possible). Everything was so whimsical yet at the same time delicious. They have a fun cocktail list. Susan and I ordered some drinks before getting seated. 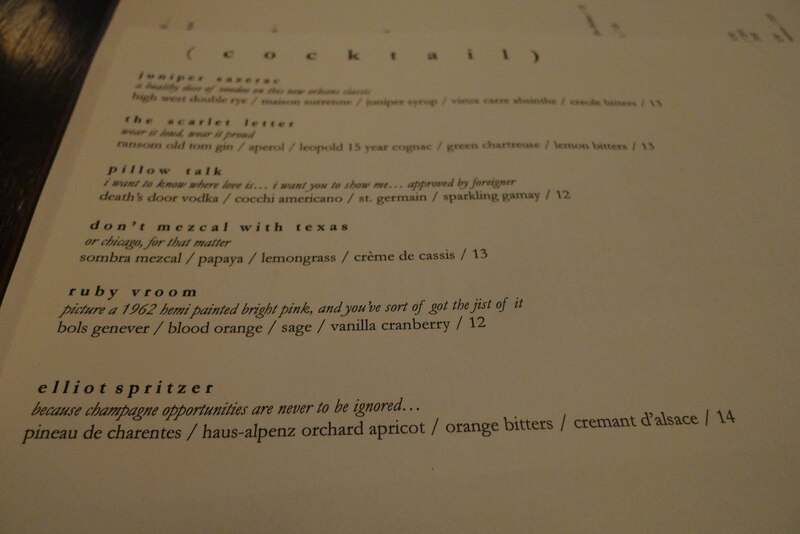 I'm a huge fan of cocktails with mezcal in it so naturally I got the "don't mezcal with texas." Mezcal is a distilled alcohol made from the agave plant (similar to tequila), but it has a more smokey flavor. My cousin fell in love with this when we went to Mexico City and there they serve it in a shot glass with a side of salt, ground chili peppers and lime. At GE, they made a lovely tasting cocktail with sombra mescal, papaya, lemongrass and creme de cassis. 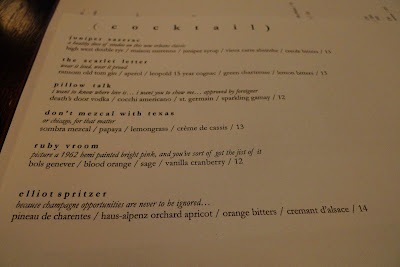 Susan got the pillow talk, which had vodka, cocchi americano, st. germain and sparkling gamey in it. 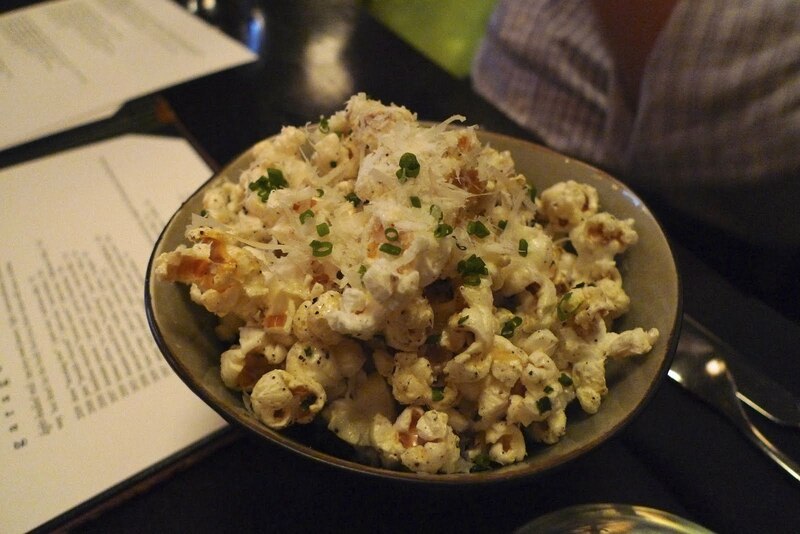 Equally delicious but definitely lighter and more effervescent. After the birthday boy and friends arrived, we were seated and served bowls of parmesan truffle popcorn. I've been making this at home now, except it's resulted in me ending up with insane amounts of popcorn in one sitting, so make at your own risk. We were served an amuse bouche of nettle pana cotta. Never had nettle before but I thought it tasted like wheat grass, very earthy. 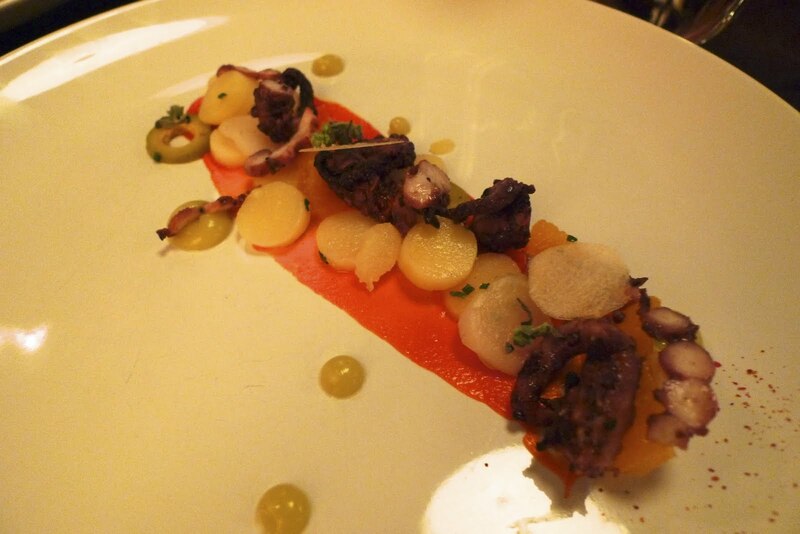 The menu consists of cold and hot appetizers, entrees broken down into sea and land, and desserts. 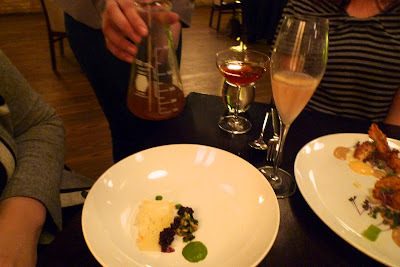 They also have a tasting menu with five, ten or fifteen items. All of the tasting menus consist of the items under the various categories and the experience basically lets you try every dish in smaller portions. We were enticed by the experience menu but wasn't sure we could really sit through fifteen courses. Susan came up with a brilliant idea where instead of us each getting a plate of the same dish, why not just order all fifteen dishes on their own and share. What can I say, we're used to eating family style anyway, so that's what we did. Under the cold appetizer menu, we order the charred octopus, farm egg and the deconstructed ceasar, which is a signature GE dish. This was the charred octopus with preserved turnip, liquid olive, smoked potato and buddha's hand. A close up. Sorry for the dark exposure, I didn't want to be the obnoxious person snapping away pictures with flash. 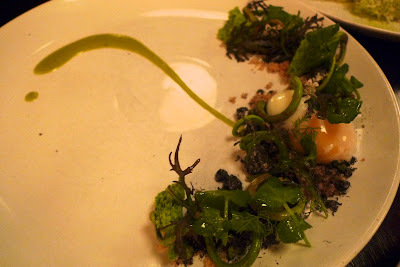 Aleen and I were excited about the farm egg, with green garlic, fiddlehead fern, wild watercress, pebble-moss-soil-stone. I felt like I was staring at one of my elementary school projects with the fake plastic shrubs and grass. This, however, was indeed edible and quite delicious at that. 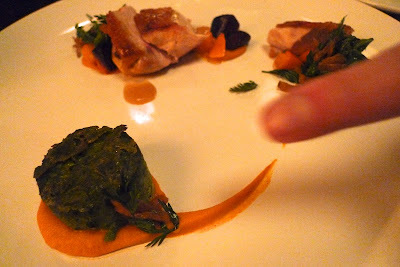 Even the pebble-moss-soil-stone thing was edible. I've heard so much about GE's deconstructed caesar and it did not disappoint. 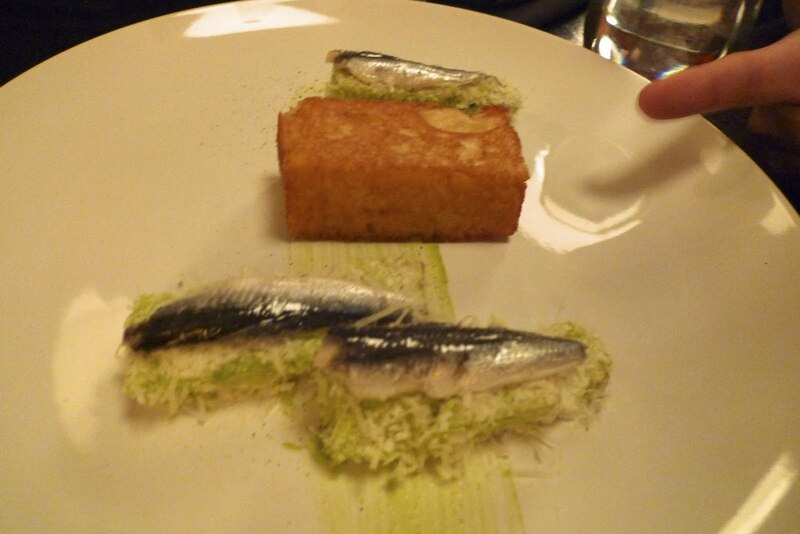 You had white anchovies on a bed of julienned lettuce with a brioche twinkle, parmesan fluff. Each element was delicious on its own, but together a lovely interpretation of caesar salad. Next, for our hot appetizers, we got the foie gras, french onion soup and crab cakes. 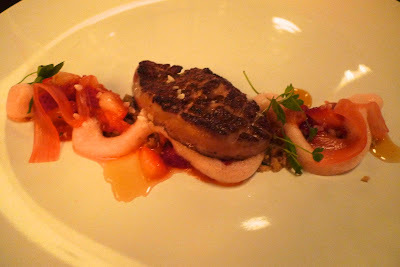 I have never met a foie gras I didn't like, but that was surprisingly light with the compressed rhubarb, green strawberry, caraway crumble and candied angelica. Next, we tried the french onion soup. 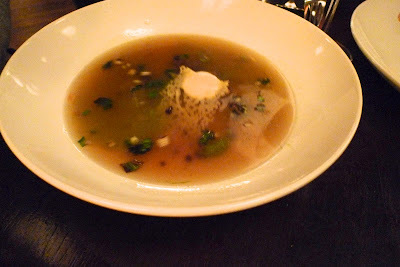 It came in a bowl sans liquid with a gruyere lace, whipped marrow, little tiny port spheres and a dollop of sauce composed of foraged ramps. The waitress then brought out a beaker with what I presume is onion broth and poured it into the bowl. I think Aleen was expecting a crock of onion soup with a light blanket of melted gruyere cheese on top, so this was definitely not what she had in mind. This too was a playful take on french onion soup that really tasted like what it was purporting to be. Another fun appetizer dish was the crab cakes. This was a deep fried soft shell crab seasoned with old bay, kohlrabi slaw, grainy mustard sauce and little glees of celery. 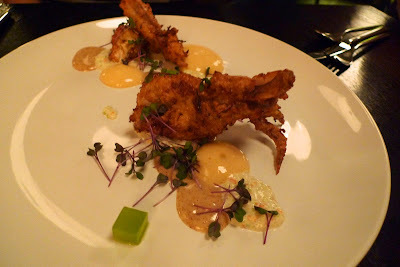 Eaten together, a quintessential crab cake, but I loved the added textural element of the deep fried crab with this. I'd take this over a crab cake any day. For our sea options, we went with two entrees out of three. I think the item we passed on was the skate. This was the Alaskan Sable dish. It was served with mounds of buckwheat gnocchi that was so light and paired well with little gems of shimeji mushrooms. 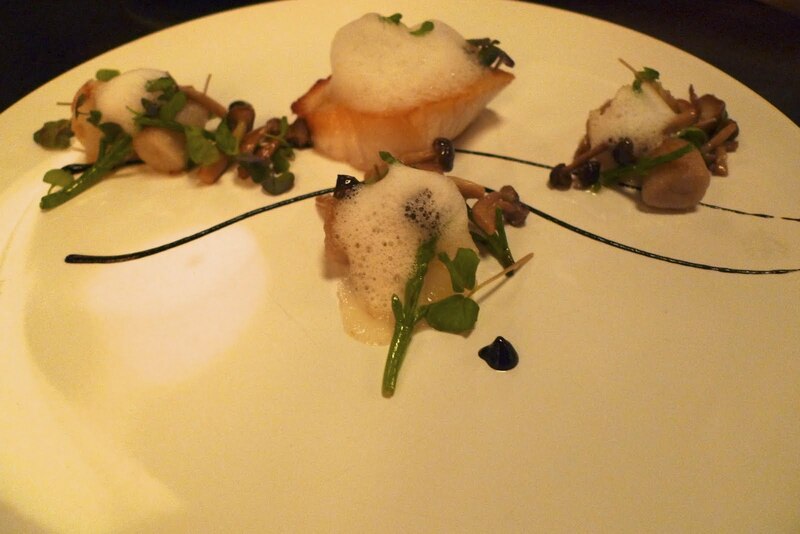 The whole dish was topped with a dashi foam that added another dimension of flavor. 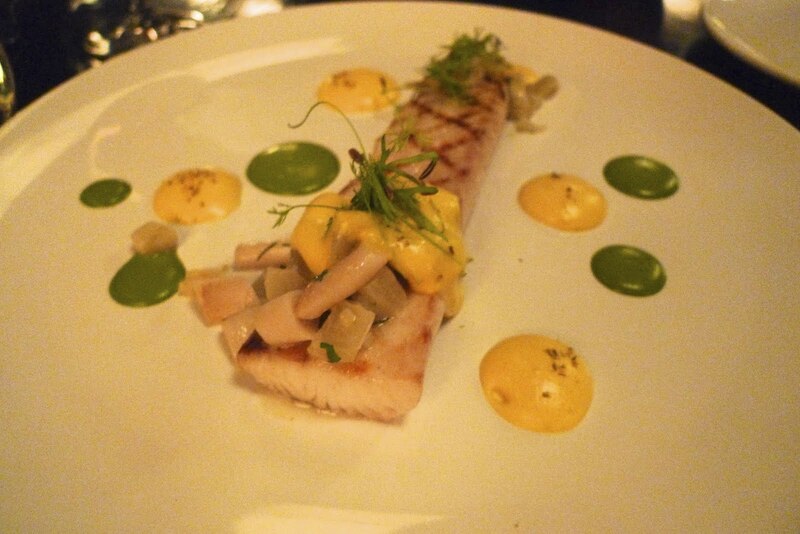 We also ordered the grilled mackerel which came with white beans, saffron infusion, which is the yellow dots, and a fennel ratatouille, the green dots, with razor clams on top. Not only was this a beautiful piece of grilled fish, but it was tasted great too. Not fishy at all, which mackerel is capable of being. For our land dishes, we chose the lamb and chicken dish. 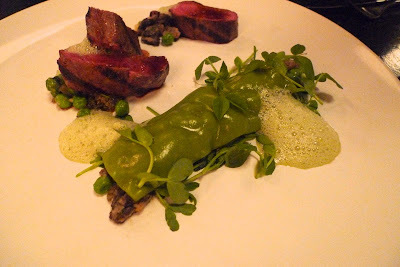 This was the colorado lamb with pea cannelloni, morel mushroom, homemade lambcetta and eucalyptus froth. As you can see GE uses a lot of froth or foam, but it's amazing how much flavor can be imparted from it. This was a wonderful take on a common pairing of lamb and peas. For our final land entree, we got the jidori chicken with nettle flan, baby carrot, granulated honey and chamomile essence. 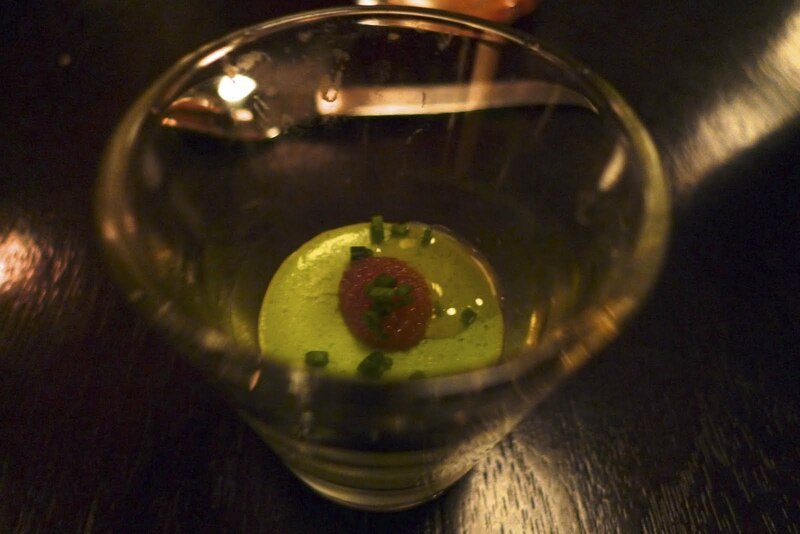 In case you were wondering, that's the nettle flan. 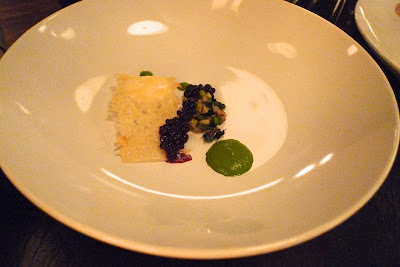 We saw a lot of nettle, ferns and other spring greens in all of his dishes. I don't think there was a single dish I didn't like. They were all excellent and a lovely introduction to spring. 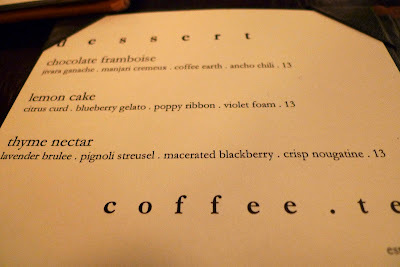 This was our options for dessert and while we anticipated trying these out too, we were so full by the end. Susan had brought cupcakes for Gook so we opted to just have those instead. 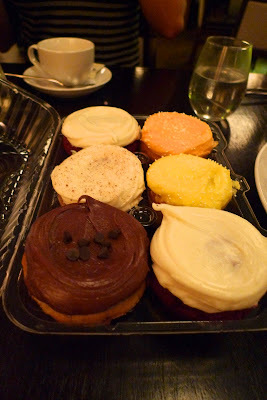 For a group of four who complained we were too stuffed for dessert, we managed to demolished six cupcakes from Sweet Mandy B's. I guess there's always room for cupcakes. :) Happy birthday Gook! only you would know this ... you nerd!